Ideas, reviews, and thoughts on simple living in the REAL world. Snoedel Aromatherapy Doll Review and Giveaway! A big thanks to A Mother’s Boutique for being a big sponsor of the Baby Mama Shower! I don’t think it’ll be long before the word “Snoedel” becomes a regular noun in households with babies. I first found out about Snoedels after stumbling across their website online and immediately fell in love with their mission and philosophy. Having degrees in Therapeutic Recreation, Psychology, and a Paramedic certification, I’m well aware of the importance of early bonding and attachment between babies and their mothers especially. The touch and smell relationship that is established immediately after birth affects both the physical and psychological development of a new baby, and can particularly impact those born prematurely! Studies have shown that babies develop faster when they are able to be with their mothers–which is often difficult to do when your baby is in a NICU. That, I believe, is the most important function of a Snoedel: to let a baby in an incubator still be able to experience mom even when she can’t hold him. The concept of a Snoedel doll is simple: the doll is made of soft flanel that easily absorbs a person’s scent. The idea is to have a parent place the Snoedel close to him or herself long enough to where the doll begins to smell like mom or dad. A child can then be comforted by the smell of her parent when the Snoedel is placed nearby. Being able to have their parent nearby in this olfactory way is comforting to babies in many situations. BREASTFEEDING: Snoedels can help to keep babies comforted while being transitioned to a crib or bassinet after breastfeeling. NEWBORNS: An expecting mom can prepare the Snoedel prior to giving birth so that the newborn can be kept immersed in mother’s scent during and after delivery. PREEMIES: A preemie can be separated from its mother immediately after birth, placed in an incubator and kept on medical equipment. Snoedels add the comfort of a mother’s scent and can start the mother-to-baby bonding process while the two are physically apart. MEDICAL PROCEDURES: The unique smell of a mother can keep a baby or child feeling more comforted and secure during the stress of medical procdures. ADOPTIONS: Snoedels can be used to begin bonding between adoptive parents and baby while the adoption is in process and the parents are waiting for delivery of the baby or child. This can be especially helpful in international adoptions, when waiting periods are longer and language an cultural differences may add additional barriers in the relationship-building between the adoptive parents and baby. IMPROVING SLEEP: Snoedels may assist in getting babies to sleep through the night. MOTHER RETURNING TO WORK AT END OF MATERNITY LEAVE: Snoedels can comfort a baby by easing the separation anxiety a baby feels when a mother must return fo work and leaves the baby in the care of others for long hours during the day. IMPROVING BABYSITTING AND DAYCARE EXPERIENCE: Snoedels may comfort a baby or child while the parents are away by keeping a parent’s scent near. TEETHING: Snoedels have knots that babies can use while teething. FOR GRANDPARENTS IN A DISTANT STATE: Snoedels can be infused with the grandparent’s scent to remind the baby or child of a loving relative that lives far away. I only wish I had known about the Snoedel dolls sooner. I’m one of eight sisters and #6 was born at only 24 weeks gestation. She was expected to be born dead but when she cried after birthing, the hospital staff quickly admitted her to the NICU. She weighed 15 oz., had only one layer of skin, and wasn’t expected to live long. For the next five months, my parents vigilantly took turns staying by her side even though they weren’t able to touch her for a long time. Even 17 years ago when she was born, it was recommended that my mother place something that smelled like her underneath my sister as she lay in the incubator to help her development and bonding. While a shirt can certainly absorb a smell, it’s not as cute or as soft as a Snoedel doll would have been! Since my sister’s experience (who, by the way, is a bright and beautiful teenager now…maybe I should write about my family more? ), I’ve watched two of my other siblings be in the NICU (for only days at a time), and also my first nephew recently for the first week after he was born. Not only do I think a Snoedel would have been awesome for these sweet babies, but as a mama, I know that being able to give my child something so beautiful and so linked to me would soothe my heart as it ached to hold my child. Babies aren’t the only ones who can find a Snoedel therapeutic! 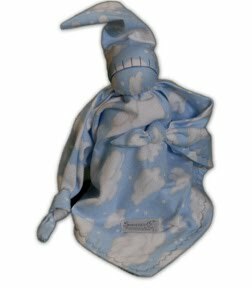 When the Snoedel family sent me a cloud print doll for my son, I was immediately taken back by how soft and big the Snoedel is. It’s not too big, mind you, but I had expected just something tiny, and this doll is 18×18″–big enough to use as a blankie for a newborn! 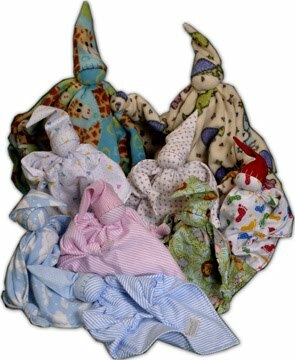 The quality is exquisite and you can tell that each one is hand made in the US and will be durable through many nights of cuddling. I immediately had to show the doll to my husband and daughter once I saw the craftsmanship and love that the Snoedel beams of. It is…a doll that your family will treasure. Washing it didn’t affect it at all, either, even though some of the stitching is done by hand (at least, it looks that way)! Win It! Snoedel is going to give one of my readers her own Snoedel. To enter, you will need to visit their website at http://www.snoedel.com/ and leave a comment here with which one you want. Be careful–whatever you choose is what you’ll receive! Be sure to leave a separate comment with your email address for each entry! Random.org will choose the winner on or after May 7th, 2010 at noon, EST. •Tweet about this contest with a link @LifeMoreSimply. Tweet 1x/day! •Grab any of my buttons and put them on your blog (1 entry/each). Note: Snoedel provided me with the sample to do this review. No other compensation was received and I was under no obligation to write a positive review. I like the Unisex one with the Pastel Heart pattern. I follow via Google Friend: allibrary. I love the cloud print- (you have good taste!). I like the jungle baby print. Thanks for the effort you took to expand upon this topic so thoroughly. I look forward to future post.